Twitch streamer Chris “Bognogus” Steinert was live on camera, reading an article about space exploration game No Man’s Sky on Gamepedia, online gaming’s equivalent of Wikipedia, when he discovered his own livestream playing at the very bottom of the page. Steinert was streaming his galactic wanderings to an audience of 3,183 viewers. One of them, it turned out, was me. On a hunt for stealthy Twitch streams, I happened upon Steinert at the very bottom of a long, rambling wiki entry about No Man’s Sky lore, autoplaying on silent in the abyss at the footer of the page. I would later ask Steinert who made up his audience that day. Well over half of them were other people browsing Gamepedia, his personalized statistics gleaned from Twitch indicate. A few engaged viewers made comments in the chat box of Steinert’s stream, but the vast majority of the Gamepedia users “watching” him may have had no idea he even exists. Who got screwed here? Advertisers, certainly. The complaint says these artificially inflated views impacted the market price for Facebook ad space. It’s a scandal in the world of digital video, an alleged fraud that induced advertisers to strategize around Facebook video and collectively dump some unknowable but likely vast sum into capitalizing on these too-good-to-be-true metrics. And there were other unintentional victims as well: the untold number of working journalists who lost their jobs as newsrooms run by smooth-brained executives decided to “pivot to video” because Facebook said viewers were flocking there, and the ad dollars were chasing them. Kotaku’s investigation into Gamepedia’s role in Twitch’s booming streaming economy adds more questions about the sanctity of digital media’s click economy, which will reach $273.4 billion this year according to media research company eMarketer. It’s a Wild West industry that peddles a vague notion of “views” to traditional brands that want to get a piece of the content gold rush. After spending time on the internet titan Gamepedia, it’s become clear that the website has some strange role in bolstering Twitch’s streaming empire. 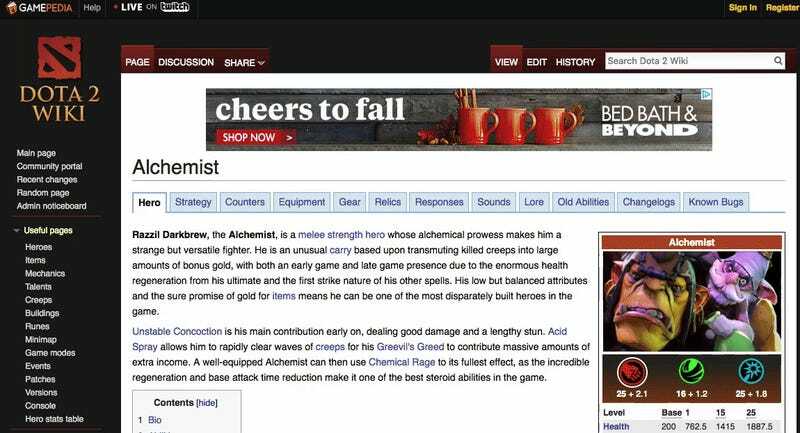 The Gamepedia entry for DOTA 2&#39;s Alchemist, which is capped by a live Twitch stream. An optimist might view Twitch’s relationship to Gamepedia as savvy, above-board entrepreneurship; a more cynical onlooker might wonder if it’s more akin to the sort of thing that’s put Facebook in hot water—especially because Gamepedia is in fact owned by Twitch through a subsidiary named Curse LLC. A Curse rep told Kotaku, “The Twitch embed is actually a replacement for other content that was less relevant to users. Gamepedia is a destination for gamers and Twitch’s focus is around content for gamers, so there it is a natural fit.” A Twitch spokesperson says that “The Twitch video player can only be initiated when the player is in view in the browser. When a viewer scrolls down the page, the player initiates once it’s in view. Views should not be inflated due to this technical setup.” They added, “Since the player only initiates when in view in the browser, any ad impressions would also be in view and counted as a viewable impression.” Twitch’s claim that Gamepedia’s setup does not result in view inflation is questionable considering data shared with us by Twitch streamers who have been embedded in Gamepedia. Kotaku’s investigation indicates that Gamepedia is apparently feeding huge numbers of unengaged, sometimes junk views to streams—sometimes in the thousands—and raises questions how about the workings of the Twitch economy at large. Twitch’s reach is unfathomably wide; its advertising page claims Twitch to has 15 million daily active viewers who, on average, watch live gaming for about 95 minutes a day. It’s home to 2.2 million people who broadcast live video content, including game streams, heartfelt conversations with commenters, and big esports tournaments. In August 2014, Amazon purchased Twitch for nearly a billion dollars. Increasingly, Twitch is the company to beat when it comes to live-streaming anything. Advertisers have caught on, too. At the beginning of Twitch streams, an ad autoplays—maybe for Call of Duty, or Reese’s cups, or Verizon Fios—and these ads autoplay throughout Twitch streams as well, sometimes once every eight minutes. According to stats from SuperData Research, Twitch is on track to make $952 million in ad revenue in 2018. Twitch has seductive numbers for advertisers. The question is whether those numbers are totally legitimate. For years, Twitch has been waging a bloody war against viewbots—bits of code that send phony viewers to Twitch streams and inflate their viewer count. And Scott Newton, the senior vice-president of Twitch’s revenue operations, emphasized in a call how scrupulous Twitch is about rooting out viewbotting or fraudulent views, adding, “I’d be surprised if anything shady is going on, especially with a company we own.” But in 2018, bots are passé, and view inflation appears to be happening in more subtle nooks and crannies of the internet. The streamer M1ndr appearing at the bottom of a long Dayz Gamepedia entry. A few weeks ago, I was scrolling through a Gamepedia entry for the survival video game DayZ when I found the streamer SadaPlays. His stream was embedded at the very bottom of a very long Gamepedia entry cluttered with niche rifle terminology and dry technical jargon. It began playing automatically and silently when I scrolled to the bottom of the page. I caught it halfway into an ad for first-person shooter game Call of Duty before SadaPlays’ DayZ stream reappeared. It looked like a couple hundred people were watching his avatar jog across a dreary field. He would later tell me that about 200 of them were Gamepedia visitors like me, based on the traffic stats provided to him by Twitch. “I don’t think there’s anything untoward with all this,” Sadaplays told me later over Discord. “I really don’t. I think Twitch is just a popular website and people embed the streams.” Streamers Kotaku interviewed who have been featured on Gamepedia uniformly say the site has helped grow their stream’s audience, but most question how meaningful these views are in comparison to fans whose eyes are glued to their monitors, or are even halfway paying attention on a second monitor. Gamepedia hosts 5.2 million pages of gaming content for an average of 133 million monthly users, according to website data scraper SimilarWeb. It is owned by Twitch through a company called Curse, a network of gaming sites. Gamepedia told Kotaku that it’s primarily supported by ad revenue. If a user’s ad-blocker is off, a Twitch stream is embedded at the bottom of each of Gamepedia’s 5.2 million pages, which details everything there is to know about over 2,000 games. It’s not readily visible or apparent that the stream is there, but it does appear to start playing when someone scrolls down, often along with an advertisement. The impact of these embedded Gamepedia streams is as difficult to quantify as it is hard to grok. 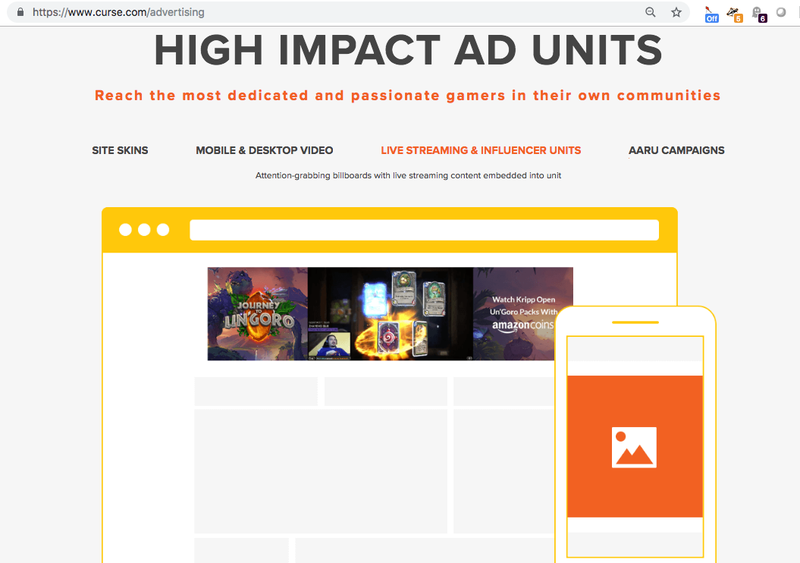 Curse’s main page showcases its enormous advertising capacity, including “live streaming &amp; influencer units”—in other words, the streams appearing on Gamepedia pages. 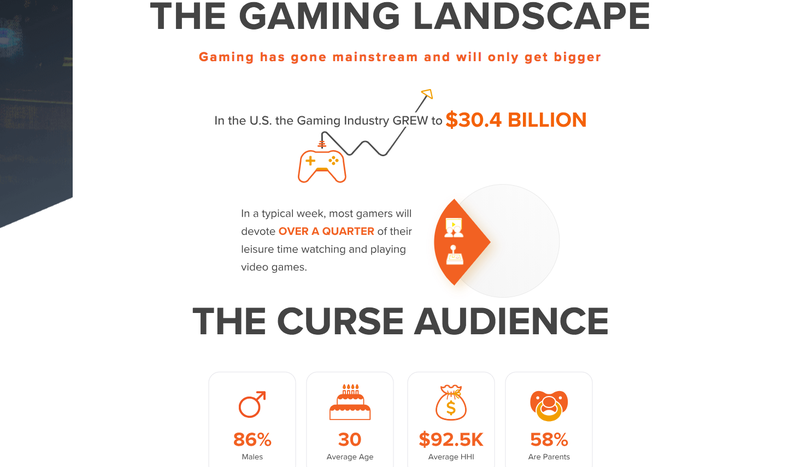 Curse’s biggest assets appear to be its ad delivery service, which help countless gaming websites monetize themselves, and the gaming websites it operates, including a couple mod sites or fan sites. What this all amounts to is a valuable audience. Eighty-six percent are male; their average age is 30; their average household income is $92,500; and over half are parents. Those are some big-money stats for advertisers. Five streamers who were featured on Gamepedia’s pages told Kotaku that their Twitch view count has been boosted by dozens, hundreds, or thousands of viewers as a result of being embedded in Gamepedia. And for the most part, they say, those boosted numbers don’t result in more fans or a significantly more active chat, indicating that these autoplaying streams for the most part aren’t engaging Gamepedia readers. In fact, Gamepedia’s own Twitch channel, which appears in a large portion of Gamepedia pages, has a disproportionately inactive chat compared to its apparently huge viewership. Watching it for five-minute periods on three separate occasions earlier this month, the stream averaged about 12,000 viewers, yet an average of nine messages were sent. Channels with an average of 200 live viewers usually see 18 messages in five minutes, an expert on Twitch streaming who is anonymous for fear of compromising their relationship with Twitch told Kotaku. Stats like this aren’t unusual among streams embedded in Gamepedia. One streamer named SirSlaw, for example, had his 805 viewers flooded by 17,357 Gamepedia visitors one day earlier this year when he was embedded at the bottom of a page—an increase of 2,156 percent. This increased his exposure on Twitch’s directory, which helped him accumulate followers. Thousands of the initial influx of Gamepedia views, however, may have been superficial. Gamepedia’s own streamer attempts to explain this in a light-hearted video featuring a man wearing a naval hat and holding a glass of brown liquid. “Hello friends,” he begins. “Mr. Woodhouse here from the Gamepedia stream. Now, some of you have been asking some questions about why our follower count is so very low but our viewer count is so very high. And it’s quite simple really. We take the Twitch embedded function and we put it in over 2,100 Wikis that we own and operate. That way our Wiki viewers become our stream viewers. They’re all humans. They’re not bots.” He concludes by taking a sip from his glass. Nothing to see here! Mr. Woodhouse is right that the views come from humans—and, in fact, many of them have Twitch accounts. An informal experiment conducted by about 40 Gizmodo Media staff saw a Gamepedia-embedded Twitch stream’s numbers appearing to inflate and deflate in conjunction with us loading up Gamepedia, watching the stream and closing out the window. That implied that visitors to Gamepedia who have the stream auto-playing on a page they are reading are being counted as “viewers” of a video. Anecdotal data from Twitch streamers and managers dispute that Gamepedia is converting even a significant amount of the people viewing pages with embedded streams to those streams’ followers. According to six instances of embedded streams in Gamepedia, for instance—which a source, who was given anonymity because they were concerned about their relationship with Twitch, provided to Kotaku—there was only an average of .4 click-throughs to Twitch per 1,000 viewer minutes watched compared to 2.3 click-throughs for four non-embedded streams. So if these embedded streams are serving to inflate the viewer numbers on Twitch streamers’ channels without gaining them tons of new fans, why are they there, autoplaying at the bottom of long wikis? A couple of years ago, Omeed Dariani CEO of the Online Performers Group, a company that manages Twitch streamers, saw an enormous spike in one of his streamers’ viewership when they began working with Curse on a promotion. “We noticed that Twitch streams were being embedded across Curse sites in place of blocked ads,” he told me over e-mail. At first, he considered it to be a clever way to expose his streamers to new audiences while simultaneously giving exposure to sponsors. Dariani didn’t give it much thought. Then came Gamepedia. 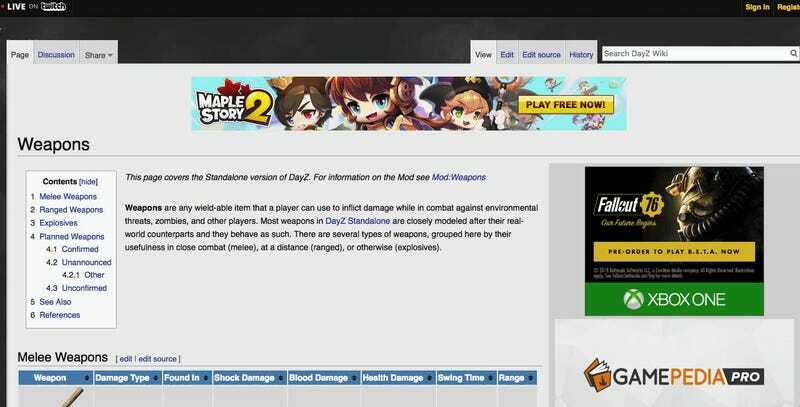 “Gamepedia is one of the biggest sites in gaming. These embedded streams throw a ton of new viewers into the channels that are selected. Depending on the size of the channels involved and the time of day, these can be dramatic percentages of the audience. We’ve seen increases up to 700-800% on smaller channels and up to 50-60% on large ones,” he told me. Curse’s advertising page demonstrating its “live streaming &amp; influencer units,” like the ones that appear on Gamepedia. Granting this, for any independent analysis of impact on sponsors—or on the seeming scale of Twitch’s impressive viewership as a whole— we ultimately would need to know what Twitch counts as a “view.” Unfortunately, that information is on lockdown. Twitch says they are not selling brands on viewer numbers artificially inflated by Gamepedia or other Curse network sites. In an e-mail, a Twitch spokesperson told Kotaku, “We don’t report on Twitch player views per se, we report on reach and frequency of the advertising in the form of impressions, completion rates, click throughs, viewability and other standard media metrics. Twitch viewability scores far exceed industry benchmarks as reported by 3rd party measurement firms.” In a follow-up call, when Kotaku asked whether Gamepedia’s inflated views counted toward these impressions, a spokesperson was unable to answer. The lack of transparency is entirely the point, though, if we do take Twitch at their word. Given what we know about how viewer metrics work and have worked, questions about them are not to be lightly dismissed by a liquor-swilling streamer. It’s tough to say definitively what is or isn’t going on with Gamepedia specifically and Twitch generally, which could fit into tech giants’ general policy of a policy of deliberate opacity. However, having spoken with streamers, analysts, agents and Twitch and Curse, what is clear is that few people involved seems particularly panicked over whether or not these viewers are paying attention to what they’re watching, or in fact watching at all—whether they are, in fact, very different at all from the very robots they’re prized for not being. In all of this, the companies are within the bounds that now obtain in technology and digital media, and seem well-positioned for a bright future. The Division’s fourth week-long global event, Ambush, is live.